We pledge to promote financial literacy of option and related derivatives to the public. We provide you with the ultimate experience to learn and view option. We provide you with the information to easily gauge the market performance. The home “Market” page provides an easy entry to get a quick feel of the market from the top down approach. The UX is designed to embed daily routine from a trader perspective. User can view charts, top 20s, futures and cash spread, important constituent stocks, forex and commodities etc. By just a few clicks, achieving an easy and practical user experience. We present the different stock, futures, stock option detailed charts for you to get access information on different depth. The two search engines on stock and options are convenient for you to get quick access of the information you need. On customization, ixOption spent much time to research on fully utilization the smartphone screen space. We hope to give users a new experience by allowing them to customize its own menu bar on financial instruments. Different users in the world can choose their colour preference on market performance presentation. For example red means up in China while it means down in the rest of the world mostly. User can now select the China style or Hong Kong (western) style in the “Settings”. It may be a little bit confusing if you are new to the option world. Therefore, we have a glossary which serves as an educational purpose to give the brief explanation on key terms that appears in the App. We also provide you with basic yet essential information such as trading hours for you to get familiar with option operation. By pressing the cue icons, users can look for further explanations on some of the keywords or guidelines on how to use the App. Do not know the value of an option? No problem. The calculator helps you to calculate the theoretical price of the option. So it is possible for you to calculate the approximate option premium. It displays some of the more important option price factors, which influence the premium, and facilitate option learning. By comparing a stock's historical volatility and its implied volatility, this enables you to judge whether the option price is overpriced or not. We present the [ long(buy) underlying stock + short(sell) call options ] in a way that helps you to analyse the covered call strategy in an extremely easy and intuitive way. Delta data is provided to users for hedging and risk management. 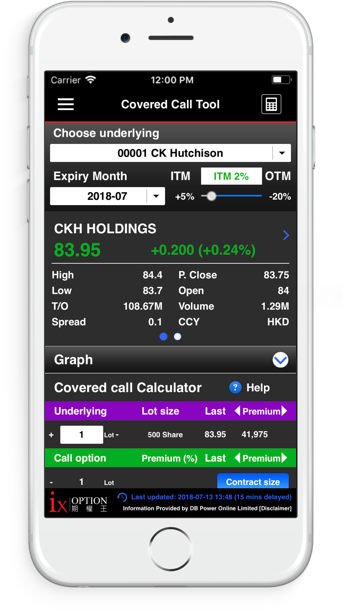 The Covered call tool also allows customers to compare option contract with different board lot easily. Contract size information is provided and applied automatically to let new option learners know the market convention in the option market.